It was great to spend the day last Friday with half of the 100%Open team at Nesta’s annual Future Fest conference at the Tobacco Dock in east London. The event was an exploration and celebration of all things future focussed, with a particular emphasis on artificial intelligence combined with centre ground politics. Akala kicked things off in style by asking if Britain is having an identify crisis? He didn’t have long enough to really go deep enough but in summary he said that of course it is, but more interestingly that this is nothing new. Britain has been built upon paradox and extreme opposites, dating back centuries e.g. Britain was instrumental in both starting and stopping the slave trade. This lead nicely on towards making the case for a more progressive nation state, where Nicola Sturgeon, the current First Minister of Scotland who shared her vision for how governments can shape the future. She was funny and engaging, albeit reading mostly off a pre-prepared script and not taking questions afterwards. 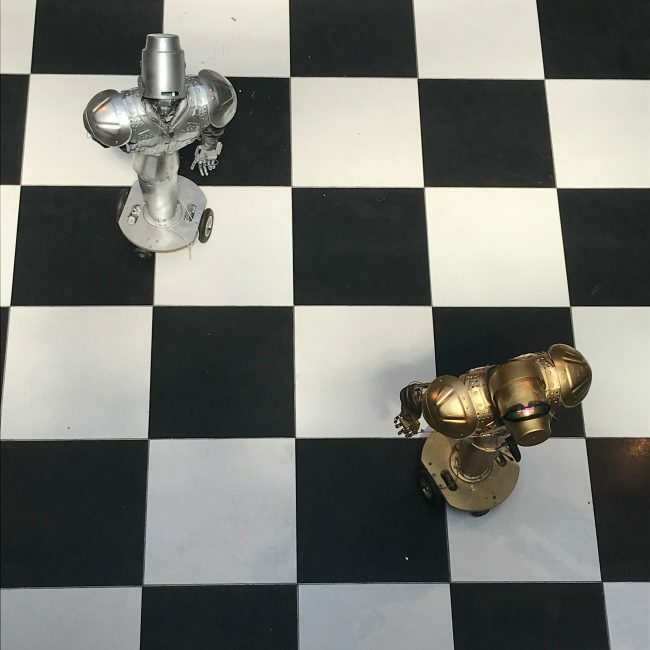 There were lots of other interesting and engage talks and happenings throughout the day, from Robot chess-dance, to the future of money (where even a smile has a price! ), to London’s Night Czar Amy Lame talking about the future of the night time economy. The end of the day saw Paul Mason giving a fantastic and wide ranging talk on how to resist machine control. 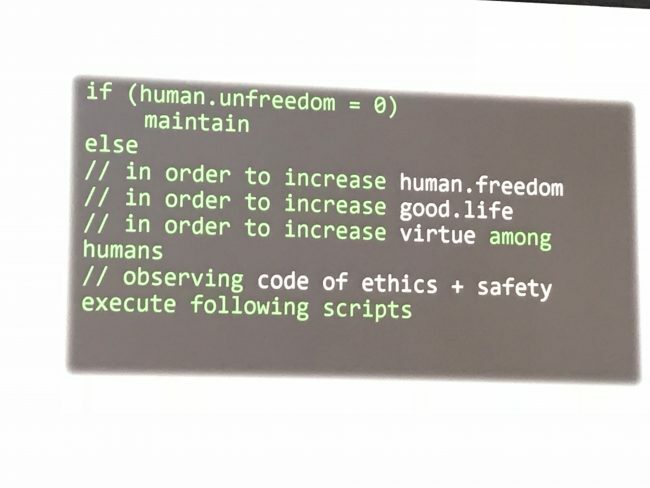 It was funny and insightful and he ended by proposing a few lines of code to create a better future in a world of ever more powerful machines (below). I started the day wondering if it was rather indulgent to spend a day contemplating the future when there are so many things in the present that need addressing. It was however great to be inspired, and connect with new people and ideas, and I left reflecting on just how fragile the future really is. In the words of one of the curators of the event, Pat Kane, we are all tasked with tackling ambiguity. The rise of digital technologies is both “the damage and the repair” to the futures we want, need, fear and expect. We are all living embodiments of Schroedingers Cat. Namely both alive and dead simultaneously until we open the box. I remain cautiously optimistic about the future but concerned that we are sleep walking into too many irreversible decisions as a society and as a nation. 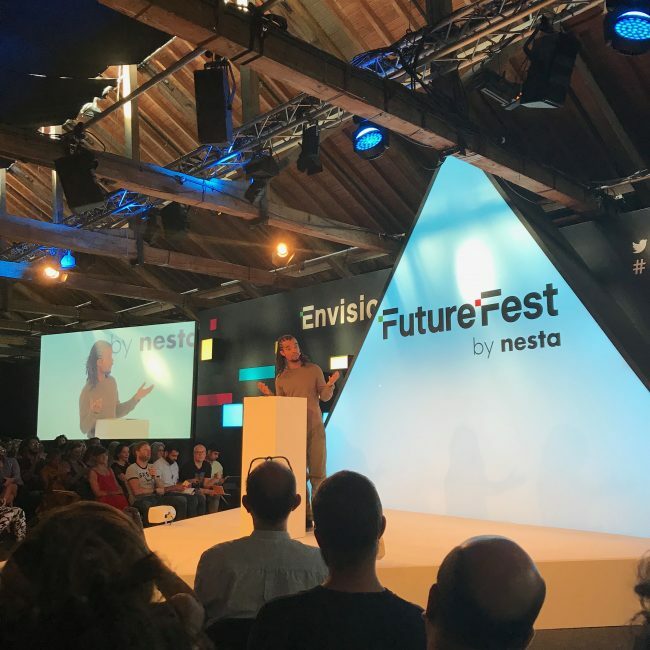 It is events like Future Fest that create the space to explore the future we want and need and congratulations to Nesta on creating the space for this type of exploration.